You are here: Home / Gear and Holsters / Signaling Tracker for Firearms? The new STF is being developed at Virginia’s Radford University. The FBI Law Enforcement Bulletin recently published an article on a new technology, the Signaling Tracker for Firearms (STF), being developed at Radford University in Radford, Virginia. The premise of the new technology is to send an electronic signal to a police officer’s Communication Center (Dispatch), whenever the officer draws his/her sidearm. The premise to provide real-time data to Dispatch of an officer who may be in a life threatening situation, and may not have had time to alert Dispatch before the event unfolded. The new technology is being developed under the guidance of Dr. Owen, a professor and chair of the Criminal Justice Department; Ms. Porter, an undergraduate in Criminal Justice; and Dr. Burke, Associate Dean of the College of Humanities and Behavioral Sciences who was a former police officer. Many officer-involved shootings (OIS) occur in low-light conditions furthering the stress and confusion. The Signaling Tracker for Firearms (STF) is an electronic monitoring device inserted into the grip of the officer’s handgun, remaining unnoticeable and out of the officer’s grip. The device, transmitting on available cellular service, records every time an officer draws and fires their sidearm. The information in automatically relayed to Dispatch, supervisors, or other included sources determined by the Agency. 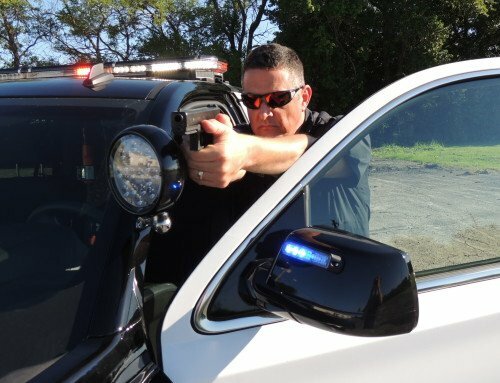 This new technology allows Dispatch personnel to closely monitor the weapons of law enforcement officers, and is currently being field-tested by various police departments. The new (STF) connects to an officer’s smart phone or in-car computer, much like a GPS tracking mechanism. An on/off switch signals the officer when the device is in use, and ready to transmit. Once activated the STF gives real-time updates to Dispatch personnel. There is a battery powering the STF that lasts around (1) week between charges. When not in use, the STF will enter a sleep mode to save battery power until an action causes the STF to turn back on and begin recording and transmitting. When the officer draws his sidearm, a signal is sent to the Dispatch center from the STF providing the location of the weapon and, thus, the officer. Other police personnel can also be alerted when an officer draws their sidearm. Additionally, if the officer fires their handgun the STF can transmit detailed information on the shooting, including the number of times the weapon was discharged, the time of each shot, and direction each shot was fired. Many OIS are single-officer events, not coordinated high-risk stops. Right now the STF System is in trials with several law enforcement agencies, according to the Radford University development team. So, for now this entire technology is a concept, rather than a literal option for police agencies. However, it appears the technology will at least reach the market in some format, so discussing the decisions agencies will be confronted with is a good idea. There are definitely some benefits to this system, but there are some serious drawbacks as well. The STF can send electronic information to Dispatch more quickly than many verbal reports. If the officer is drawing their sidearm in a sudden deadly force situation, there is often a delay in radio broadcast as the officer attempts to deal with the immediate threat they are facing. Even when the officer finds time to broadcast their predicament, the information is often sporadic, incomplete, and full of the adrenaline dump from the officer’s reaction to the threat. Provides responding officers a better search pattern. 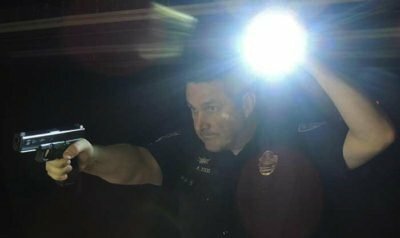 In the video above, from Hamilton, Montana, the officer did a pretty good job of reacting to a deadly threat (despite having his flashlight in his strong hand). However, it took 10 seconds from the suspect presenting his handgun to the officer being able to broadcast the emergency. During that time Dispatch could have already alerted other officers to be en route. The electronic signal from the STF may not provide detailed suspect information, or officer condition, but the signal will alert to the firearm being drawn, and fired. This will allow Dispatchers to send real-time emergency assistance even before the officer may be able to make a broadcast. In addition, should the officer become incapacitated, STF transmitted data will be able to provide direction of shots from the officer’s handgun. This could enable responding officers to have a much faster idea of where a fleeing suspect may have traveled, particularly if they were on foot. Officer-involved shootings (OIS) have been receiving much stronger scrutiny in the last few years. The data gathered using the STF could assist in officer-involved shooting investigations, or those incidents where an officer simply drew their handgun. Information can also be gathered about how long the officer’s sidearm was drawn, which can directly contradict a complainant or witness who stated the officer was constantly pointed their handgun at someone. Officer memory can be hampered due to high levels of stress occurring in an OIS. Agency investigators can use details from the STF about when and where shots occurred. The electronic information could also dispel false accusations about when and how many shots officers fired. Agencies considering the implementation of the STF technology have several matters to consider before implementation. The STF devices can yield a variety of data about the officer’s use of their handgun. However, deciding who will monitor, retain, and access the generated data are questions that an Agency needs to have in place prior to deployment. Procedures on how the information will be received, and disseminated should be clear, as well as the responsibilities of all who will have access to the information received from the STF. 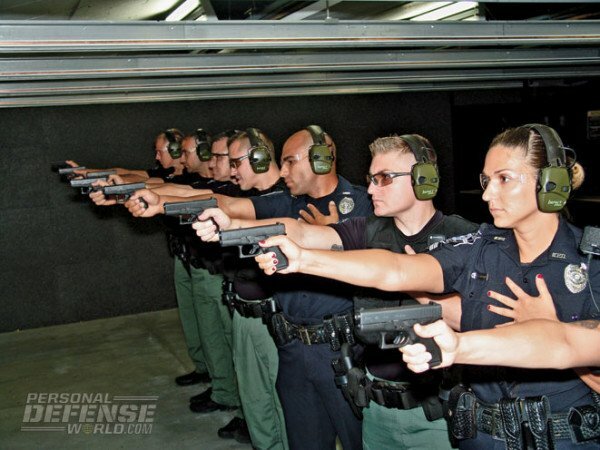 Firearms training should disable the STF, but just how that is done will be an individual agency problem to solve (Photo by Personal Defense World). During these situations the Agency will have to determine if officers will switch off the STF device; leave it on, but provide a notification to Dispatch prior to withdrawal; or take other steps. This part of the decision-making process will likely be more problematic than the actual implementation of the STF in the field. Obviously, turning the STF off during the non-duty related functions mentioned above would be the best solution, but officers forgetting to turn the unit back on is a real possibility. This obviously defeats the benefits the STF can provide. The majority of American law enforcement agencies have small numbers of officers or deputies, and their budgets are likewise limited. Agencies will also have to determine if STF technology is cost-effective for their budgetary constraints, and if the additional expense will be supported by their communities. This decision will likely be determined on the proximity of the agency to a larger metropolitan area, where higher crime rates occur, or on the particular demographics of the agency’s jurisdiction itself. Dispatch and radio procedures for duty draws. Obtaining the latest, greatest technology is often not in the best interests of budget-strapped agencies. Many times smaller agencies must cautiously evaluate expenditures, and have very little wiggle room when it comes to obtaining new technology. Deciding on which officers will receive the STF device also will be an important factor in determining cost. In addition, the cost of replacing batteries will become a major consideration. So far there is no information on what type of battery the STF will require, and this could be a major financial consideration. 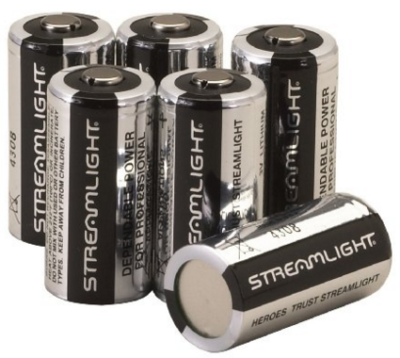 Modern police officers already go through batteries like a novice goes through chips at a high-stakes poker table. The STF may require battery replacement multiple times per month, per officer. In addition to a significant cost for the batteries (or chargers), standardized procedures will have to be implemented to ensure officers do not go into the field with dead batteries in their STF system; a serious problem for a device that goes through batteries so quickly. CR123 batteries have become highly popular, but run nearly $1.50 per battery! The STF technology relies on cellular networks to transmit data. In more rural areas, Agencies will have to consider the cellular coverage availability when deciding on the STF System. If large areas of the jurisdiction have no or poor cellular service is it cost-effective to even consider purchasing STF. Even if an Agency in that circumstance does move forward with STF, procedural guidelines must be established to consider when a device is out of range. In those situations, the STF can still record data, but the data cannot communicate with Dispatch until they are back within range of appropriate networks. This could cause confusion if an officer or deputy checks on a building, drawing their sidearm, only to return to an area of coverage to have the STF broadcast their sidearm withdraw initiating Dispatching protocols. The STF technology should be viewed as innovative forensic tools. With this in mind police agencies will need to develop policies and procedures to address their use, application, and data collection for potential evidence. In a best case scenario patrol officers would have a significant input on how the policy and procedure is written, as they will be the ones most impacted by the STF application. The U.S. Supreme Court allows new technology as evidence, but only under strict requirements. 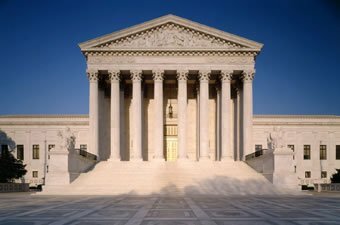 In Daubert v. Merrell Dow Pharmaceuticals, Inc., the U.S. Supreme Court ruled admissibility decisions are made based on the “scientific validity—and thus the evidentiary relevance and reliability—of the principles” of a new technology. If Agencies are planning on using STF technology for evidentiary purposes (which they absolutely should), they must be partner with local prosecutors to prepare to address how STF meets the Daubert requirements. If agencies decide to implement STF, there will need to be a serious effort to ensure officers are properly trained. This training will have its most impact during In-service training, but might be able to be implemented into Regional Police Academies if the technology is recognized and used by enough area agencies. Training will be necessary for all officers using the STF, including supervisors who will likely be responsible for reviewing STF data. In addition, dispatchers will need definitive training on the system and how the information will be received and then transmitted over the radio or MDT. The Signaling Tracker for Firearms is an innovative invention with some very beneficial characteristics. Knowing that drawing your sidearm will alert Dispatch, and potentially other officers through the MDT, is a reassuring feature. Should shots be fired, knowing that you don’t immediately have to get to your radio for a broadcast of the assistance call is another great feature. However, the arduous process of implementing the STF into every-day use is a serious hurdle to overcome. Add to this process, the potential high cost of battery replacement, battery chargers, and training, the STF may become very limited in opportunity to the larger agencies that can absorb costs better. Not to mention, the requirement for the STF to have a viable cellular network to broadcast its information real-time, and suddenly this product could get even more limited in use. So far the development team has not released the purchase cost of individual units (likely not finalized until a business partner comes on board), or the type of battery required to run the STF. These cost factors will play a major role in determining if agencies can even realistically consider the STF at all. I’m hesitant to endorse this product without more information, and especially since not every draw necessitates a broadcast for help. Two officers checking an open door can likely accomplish the task with no other assistance, even though they will likely draw their sidearms. Perhaps if the STF can be narrowed to only broadcast on an actual shot being fired it would be more beneficial and avoid most of the procedural difficulties.